Seen a bunch of new gang graffiti around these parts lately. Lots of crossing out the others names. Lotsa different colors. More shops and garages getting tagged. New spots that have never seen graffiti. Angry tags. Taunting tags. Is it just the winter blues? What does it all mean? Lets all hope for peace. Just look at what unneeded wars have done for this country. Cut Chemist "Live at the Peacepipe"
Yep, I've noticed it too. 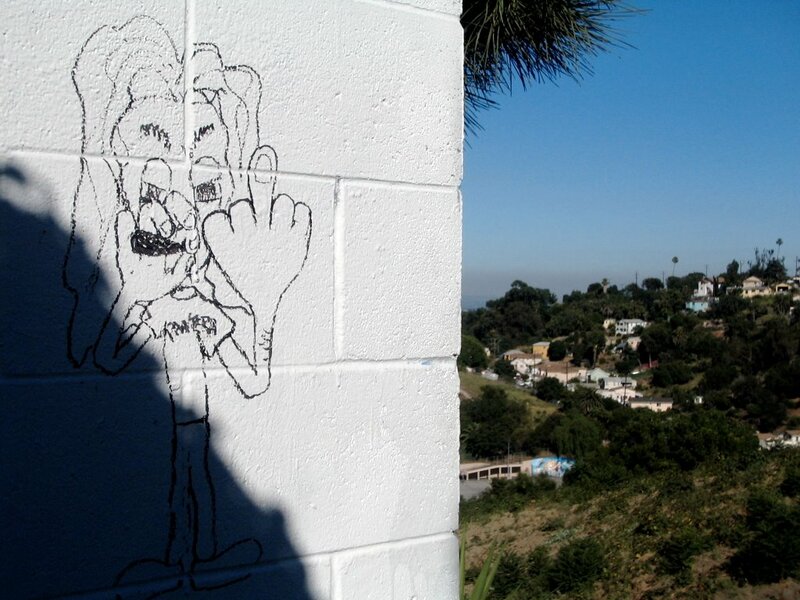 I even saw a guy spraying graffiti on a building in broad daylight as I drove down San Fernando. I wasn't going to confront him, but I wasn't sure what to do. Call 911? 311? I wonder if there's a neighborhood graffiti hotline. The local Mexican gangbangers are active again in my neighborhood. Lots of gnarly tags. Wish I could read the code. Yeah, tagging and anger all over in our beautiful part of town lately. I walked the dog past a big crew tagging the bathrooms up at Debs park last week and they stopped just long enough to give me the mad dog look. I watched two guys tag the street sign across from my house last night then had someone come back and tag over it later. Yesterday a guy gave me the finger for no reason at all as my wife and I walked by with our baby in a stroller on Berenice ave. What the F...? My neighbor had a similar confrontation with an AVES member last week, just random anger and aggression. the random anger is out of control all over. It seems to be a cool thing to debase another, and that's nothing new in these parts. It's that right of passage thing for the gangs and even the wannabees! I suppose you could say that the lack of education has something to do with it. Also, if you look at the world as a whole today, you see that if a confrantation arises violence is the most popular 1st reaction. It's very sad that being a badass is cool to some people. This is learned behavior from all sorts of sources, even our own government. We need to make compassion cool and the 1st step is to get the cowboy out of control, cuz that's something we should've evolved way beyond by now. Mabe we show them that anyone can be violent and it takes real power and strength to be compassionate! I dunno, just a simple mans take. I know some Aves elders and they feel the same way. The ones I know are disgusted with these random acts. The kids don't even respect them!